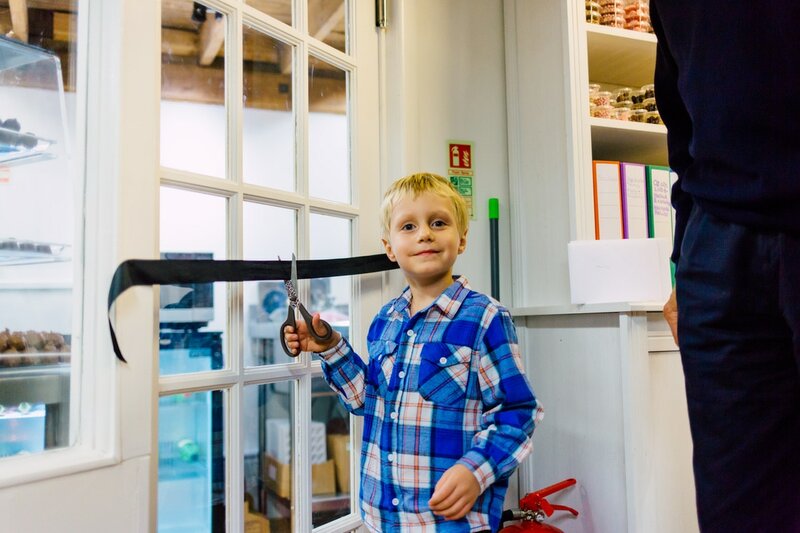 Our workshop was officially opened by our Chief Chocolate Taster, Elliot (pictured left) in September 2016 after a week of building, hammering, drilling and generally making a lot of noise in the old, converted milk parlour. We expanded in to a neighbouring unit in September 2017 and are enjoying the extra space (before it's filled to the rafters with chocolate!). The view from the 'office' window is fantastic! ​The craft centre itself houses a lovely selection of independent craft and retail businesses and a courtyard cafe serving a great selection of hot and cold food - a grand day out in beautiful rural Warwickshire. ​Our chocolaterie is at the Yew Tree Farm Craft Centre at Wootton Wawen, Warwickshire B95 6BY just off the A3400 Stratford Road south of Wootton Wawen village centre by the aqueduct. ​Any questions please call us on 01564 794718 and we'll be happy to help. ​Opening hours Tuesday - Sunday 10-5.